Antique wall clocks can be found in many forms almost all are collectable depending on condition. The basic difference between them is they are either spring-driven clocks, which mostly run for eight days, or weight-driven clocks which run for 30 hours. They range from the plain Edwardian school clocks to elaborate Ormolu mounted French Cartel clocks. Antique Wall Clocks of the Victorian and Edwardian periods are familiar to most people who have grown up with our countless school, kitchen and waiting room clocks. The earliest form of household wall clock was the Gothic chamber clock, made in Germany, Switzerland and in Holland. Despite the name, these clocks were made from around 1450 to 1650. They are very rare, but because of their bulk fetch only moderate prices at auction. A British development of the Gothic chamber clock was the lantern clock. A large bell on its top gives this clock its characteristic domed shape. Most London-made examples date from before 1720, although some were produced in the provinces as late as 1800. The majority run for 30 hours and have only a single, hour hand. Buying a lantern clock needs knowledge and experience, or expert advice, as many were converted to table or mantel clocks in the Victorian era. There are a great many forged lantern clocks around. Prices range from £400 for an example in poor condition to more than £5000 for one in good condition by a well known or reputable maker. Mid-European clocks from the 18th and 19th centuries include Black Forest wall clocks, which generally have a 30-hour movement framed in a wooden case. They are recognised by an arched wooden dial, usually painted with bunches of flowers or country scenes, and some have a cuckoo mechanism. They were much copied around 1800 in the eastern United States, where they are known as wag-on-the-wall clocks because of their short pendulum which beats every half-second and can hang in front of the dial. Austrian wall clocks known as Vienna regulators were originally made to a very high standard during the Biedermeier period of the early 19th century. They have a high-quality movement, with small driving weights and usually no strike. Most cases are made of boxwood, ebony or birch with glazed panels, and are severe and architectural in style. These clocks are generally expensive, fetching upwards of £10,000 at auction. A second type of Vienna regulator was mass-produced in Germany from about 1860 into the 20th century: with many striking and quarter-striking pieces in walnut cases. Many have ebonised mouldings and turned decoration, with some later examples in the Art Nouveau style. Postman alarm clocks were also made in the Black Forest in the mid to late 19th century. They have a white-painted 5in (12.7 cm) round dial with a turned mahogany or birchwood bezel, or surround. The 3o-hour movement is powered by a cast-iron weight. Dutch or Friesland stoel clocks date from the 18th century. They have a painted dial and an arched canopy, decorated with elaborate cast-lead fretwork protrudes over the clock. Access to the brass, 30-hour verge movement with a bell at the top is through side doors. Staart clocks, which replaced the stoel type in the 19th century, have a 30-hour anchor movement. The long pendulum is housed in a boxed tail below the wall bracket. The painted tin-plate dial often has a charming country or town scene. Stoel clocks generally command higher prices than Staart clocks. The wall dial is the commonest type of British clock after the longcase, and originated in London in the 1760s. It is a spring-driven equivalent of the Act of Parliament clock and owes a debt to the French cartel clock. Early wall dials have an unglazed round painted wooden dial, about (38 cm) across, fixed to a movement that is housed in a wooden box. They always have a hole in the back to fit on a wall hook. Clocks made from the late 18th century onwards have a glazed dial, the face silvered from about 1770 to 1820 and made of painted iron thereafter. Most examples dating from around 1775 have a mahogany box instead of the earlier painted pine. Georgian clocks have a wooden bezel, while Victorian and Edwardian wall dials have a turned brass one, and a half-second pendulum. Victorian drop-dials are recognisable by their long movement box, which can extend some 12 in (30cm) below the dial. The box has a window through which to view the pendulum. The case can be plain mahogany or have mother-of-pearl, brass or boxwood inlay, and some are papier-mache. Cartel clocks were a French innovation devised in the Regency period, about 1720. These forerunners of the British wall dial are highly ornamental, many designed by leading cabinet-makers and decorated with boullework, ormolu or painted tin-plate. Louis XVI and Empire examples are almost always Neoclassical in style and made of ormolu, although all styles were reproduced in the igth century. British cartel clocks were made between 1760 and 1800 and are carved giltwood in the Rococo style. Their silvered dials are 6in (15.2cm) across and have a mock pendulum and a prominent script signature. 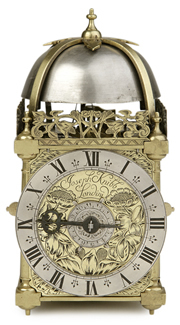 Sedan clocks, which date from the Regency period, were often made using earlier watch movements and dials. They were re-housed in a 3in (76 mm) circular or rectangular brass-rimmed mahogany case. The brass loop fitted at the top of the clock was for hanging the clock in a sedan chair. American banjo clocks from the early t9th century have a glass-fronted banjo-shaped case; many are painted with patriotic subjects and later copies can sell for several thousands of pounds. ACT OF PARLIAMENT Clocks : An Act of the UK Parliament passed in 1797 which taxed all clocks and timepieces and legend has it that it made people hide their clocks and watches and rely on clocks kept in public places such as taverns and inns. The large weight-driven clocks said to result from the Act became known as Act of Parliament clocks, although in reality these clocks had been made since the 1720s. The Act was repealed within a year, but the clocks continued to he made well into the 19th century. They are also known as tavern or coaching clocks. A one second pendulum is housed below the dial in a trunk with a door about 39in (99cm).